Mr. J.C. Roth taught high school physics at Uni High — USDHS — University of San Diego High School. I have no idea what years he taught there, but he was a great teacher who I totally underappreciated. I got semi-famous at school for this caricature, perhaps my best caricature ever. Roth had a wonderful face and for all his New York gruffness, was a very kind man. He had moxie and chutzpah and when I think of the best teachers I have had in my life, I think of him. He was smart and engaged and did not take any crap. You could not fall asleep when Roth was teaching. I remember when we had a guy in our class who was voted “most likely to succeed” and was in the yearbook for that. Mr. Roth said very seriously, something like “that’s great, though my experience is that those kids tend not to do so great, it’s true” — totally deflating the kid and not something you would expect a teacher to say. Roth was totally not joshing the guy. He was telling him his experience, which — well, who knows how many years he had been teaching? People liked this caricature so much they would ask for photocopies of it. I wonder if any of my old classmates still have a copy? 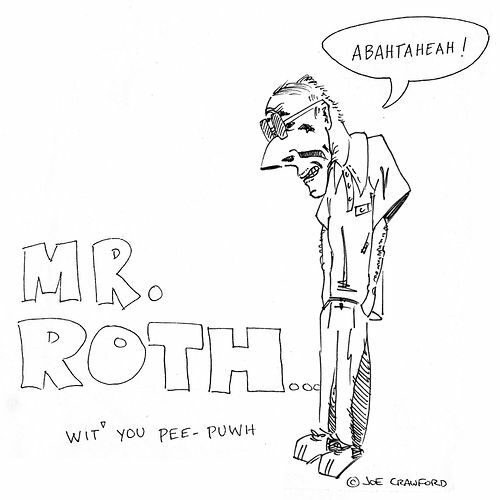 Further, I wonder what happened to Mr. J.C. Roth? He reminds me now of the character of Kramer from Seinfeld. I remember Roth talking at one time about how the best way to drive is barefoot, so you can get maximum sensitivity from the car. Why that has stuck with me, as opposed to the lessons of Newton’s laws of motion? Well, that was Mr. J.C. Roth. And here he is wit’ you pee-puw. Joe Crawford blogged this at 12:02pm in 2005 in August. The 2nd was a Tuesday. You are reading this 14 years later. Comment. There are 6 comments Tweet. Send email. It has hashtags→ drawings memories . “Mr Shields…..What are you Mr Shields….a vistor in my class??? Am I going to see some homework this week Mr Shields?? ?” Aside from his Bronx mentality and sometimes severe gruffness…he truly was one of the best teachers I’ve ever had……. I graduated in 1983. Mr. Roth was indeed an icon. “Aw wight, weah gonnuh cwank out a few uh dees pwoblems ovah heah for some uh you pee-puw”. We had a Mr. Roth dress up day, during which we donned our best polyester. Roth, ever aware, commented that “Imitation is the most sincere form of flattery”. At times, we were semi-clever. After repeatedly admonishing a girl for turning around and talking to the student behind her in class, Roth had had enough and fired up on her. She was overweight, and well, Roth wasn’t always PC. Here’s the quote to the best of my recollection. “Jenny…you fat glob. Turn around, zip your lip, and cement your hamhocks to the chair”. WOW! You could have heard a pin drop. We all loved Roth because he could call it like it was. That guy was classic. They don’t make them like that anymore. He wouln’t last a New York minute in todays schools. I graduated in 2000 and I believe that was his last year or he taught one more after that but I know for sure he was gone in 2002. By far the best teacher I had all four years at UNI. I also googled him and stumbled upon this hilarious caricature. My favorite of all his sayings was “Down heeeeeer along da way”. Does anyone know what happened to him? I know in 2000 he use to tell us that he taught some consumer education courses in la on the weekends. This isn’t the first time I googled him but I’m really curious to find out where he ended up. chris, I wish I knew where he has ended up. If anyone knows, please share! I graduated from the class of 95. he was one of the best teachers at UNI! My friends and I were just talking about him yesterday. If anyone know what happened to him please let us know!